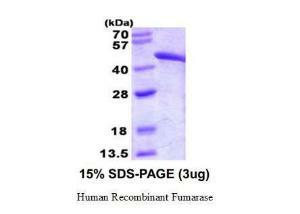 Fumarase (Fumarate hydratase) is an enzyme that catalyzes the reversible hydration/dehydration of fumarate to S-malate and is involved in the tricarboxylic acid (TCA), or Krebs cycle. This enzyme exists in both a cytosolic form and an N-terminal extended mitochondrial form. The N-terminal extended form is targeted to the mitochondrion, where the removal of the extension is the same form as in the cytoplasm. 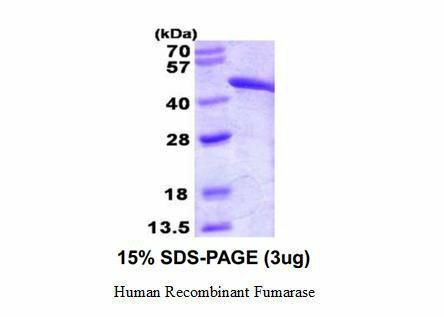 Fumarase deficiency can lead to progressive encephalopathy, cerebral atrophy and developmental delay and this enzyme also is thought to act as a tumor suppressor.